My kids love this jelly animals I made last week on Gen's birthday. I've actually reserved these animal shapes for them as I made all of my gelatin in big molds. These jelly shapes in dove, elephant and fish are a sure delight in my kids' eyes that they love it more than the others which I made with more fillings like raisins and pineapple. Kids really love shapes in any form and any size and these animals attracts their attention. 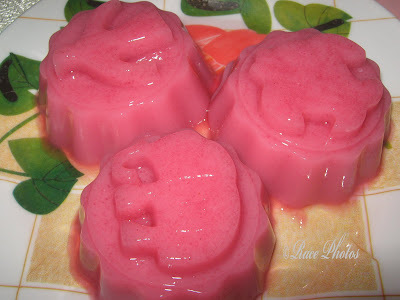 These jellies are super yummy too as I've put milk and eggs on it just like leche flan. How about you, are you fond of eating animal-shaped jellies?